The weekend starts here Baby! Time for a new challenge over at CES, which brings my GD Spot to a close. :( Thanks so much for having me Girls, I've really enjoyed playing along. So what do we want to see for a chance to win a £10 Gift Voucher to spend in Crafty Emma's Store? Embossing. What a fab challenge, right? I loved making this card. My beloved string is back in the running (breathe Jane!) and I've had this pretty paper stashed for literally a year, because I couldn't bring myself to cut it up. This image just seemed to go perfectly with it though. Aaww! Hugs to you, you must have missed Sweet Cheeks, but if you're like most of us it won't be long til you're thinking that 3 hours at nursery are not enough lol!! Just gorgeous Faye! I love the layout, the DPs and of course your colouring! How beautiful, Faye! Your colours and colouring are fantastic and I absolutely love the DP! I love the embossing too and your embellishments all work very well together. Funny when the little ones start nursery i remeber that empty feeling. yes I know it seems strange now, but sweet cheeks will love nursery cos you've given him the best head start, and I promise you that it is more heart wrenching for you than him, and he'll be so happy to see you when you pick him up, you won't be able to shut him up as he tells you excitedly what he's been doing in nursery. Think of all those handmade cards and gifts you will get over the years, you'll cherish each and every one. Think I need that paper, off to google. have a wonderful weekend/bank holiday, mwah! Completely understand your feelings when leaving Sweet Cheeks at the Nursery School....hope he enjoyed....so you can enjoy next time being without him....you'll get used to it.......your card is gorgeous...nice papers and lovely colouring! Oh you have mentioned one of my all time favorite films...The Green Mile.. Wonderful card! Cute image and I really like the use of the twine. I can image why it took you so long to use this pretty one! It is absolutely WOW! This is gorgeous love the paper & the image is so sweet. Love it!!! I still remember when all of mine went nursery I went through lots of tissue....not from them pushing it down the toilet tho but from me bubbling my eyes out the whole time they were gone lol. Wow, this is sooo gorgeous. Your colouring is amazing. Enjoy the weekend. 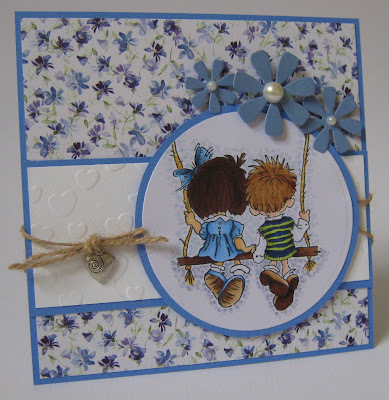 This is gorgeous Faye, I have loved all your GDT cards, each and every one was really lovely! Beautiful card Faye,I like the image and your string, Ive got the same paper and still haven't used it, I hope sweet cheeks enjoyed his taster of the Nursery. Love the card faye! The backround paper is so pretty! Adorable image, pretty flowers too! Hope you get some crafting done when you get used to him being away for a bit. Hi Faye! Fab card. Lovely to have had you at CES challenges. Yes the paper is very pretty and so is the sweet image. Thanks for joining us at Craty Cardmakers.